Lenny Wilkens is a retired American basketball player and coach in the National Basketball Association (NBA). He has been inducted three times into the Naismith Memorial Basketball Hall of Fame, first in 1989 as a player, as a coach in 1998, and as part of the 1992 United States Olympic "Dream Team", for which he was an assistant coach. From the 1994–95 season until the 2009–10 season, Wilkens was the all-time winningest coach in NBA history and retired still holding the record at 1,332 victories. Wilkens is now second on the list behind Don Nelson. Considering he led the Supersonics to their only championship in 1979, coach Lenny Wilkens deserves some love from the Seattle faithful. But it was his scripting of unselfish offensive dynamics surrounding strong defensive play that truly got the best out of Wilkens' players. He ranks among the all-time leaders in assists, free throws and games played. At the time of his retirement, he was the NBA's second all-time leading playmaker. He was a nine-time NBA All-Star and was named Most Valuable Player in the 1971 All-Star Game. From 1961 to 1969, he also served as Vice President of the NBA Players Association. His record as a player earned him induction to the Basketball Hall of Fame in 1989. At the end of his playing days, Wilkens continued his coaching career in the NBA. He served the Seattle SuperSonics as both Head Coach and General Manager, leading them to an NBA Championship in 1979. He coached the Cleveland Cavaliers for six seasons, and was Head Coach of the Atlanta Hawks from 1993 to 2000. In three of those seasons, Wilkens led the Hawks to 50 victories, including two consecutive 50-win seasons. During his coaching career, Wilkens also served as President of the NBA Coaches Association and was active in the U.S. Olympic basketball program. Wilkens received two Olympic gold medals, as Assistant Coach of the 1992 U.S. "Dream Team," and as Head Coach of the 1996 U.S. Olympic basketball team, a second consecutive Olympic championship. In 1994, Wilkens was named NBA Coach of the Year after leading the Hawks to a 57-25 mark, the best record in the Eastern Conference. He also served as a head coach in four NBA All-Star Games. He became the NBA's winningest coach on January 6, 1995, when he guided the Hawks to a 112-90 win over Washington for his 939th career win, surpassing Red Auerbach's 938. Later that year, he became the first coach in NBA history to break the 1,000-victory threshold. After the 1997-98 season, he was named to the NBA's list of the 50 Greatest Players -- and Top 10 Coaches -- in the league's history. 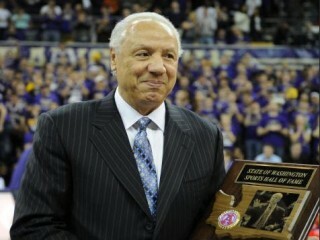 View the full website biography of Lenny Wilkens.